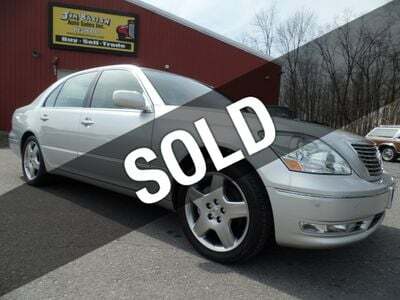 You are looking at an Unbelievably LOW MILEAGE and Absolutely Beautiful, Clean Carfax, ONE-OWNER 2006 Lexus LS 430 Sedan with ONLY 48,483 miles. This will be Jim Babish Sr.'s demo for the Spring, Summer and Fall, or until it sells for $24,900. Shown BY APPOINTMENT ONLY to serious, pre-qualified buyers. Please call ahead to see this LOW MILEAGE, LOADED Lexus!! FULLY SERVICED with a FRESH 5/20 PA State Inspection and Emissions. LOADED with Factory Options, please read the list below!!! PLEASE be sure to VIEW ALL 54 detailed PHOTOS at www.jimbabishauto.com. For any questions or for more information, please feel free to call or email us. We are at 698 Eisenhower Blvd., Johnstown, PA 15904, only 77 miles east of Pittsburgh, and this vehicle is for sale locally and on several other sites for $24,900. ... Always be sure to check www.jimbabishauto.com for Current Pricing and Updated Information, like mileage, options, etc. ... Like all of our Qualified Vehicles, this one is protected by a Powertrain Plus Warranty from Guardian Warranty Company. No Worries, JUST DRIVE! Please be sure to ask us about Extended Service Contracts to further protect your purchase. We are set up with several banks and offer competitive Financing rates. We take trades, WE BUY VEHICLES and we sell to people all over the World. Thanks for viewing this 2006 Lexus LS 430 Sedan.